NAMM 2010–Peavey proudly introduces the new TriFlex II, a three-way, two-channel portable sound system that provides 1,200 watts of power for live sound reinforcement, DJ gigs and music playback applications. 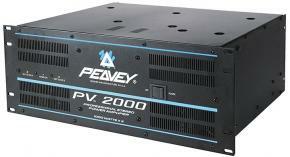 The Peavey TriFlex II system is a complete sound system providing 1,200 watts of power through a three-speaker setup—one 15″ Peavey subwoofer plus two satellite speakers with 10″ premium woofers and Peavey RX14 1.4″ titanium compression drivers on patented Peavey Quadratic Throat Waveguide horns. The system is engineered for balanced sound and crisp presentation regardless of the application, with clear sound at high output levels and plenty of punchy bass. The TriFlex II chassis is housed in the subwoofer enclosure and includes all of the system electronics—two-channel preamp, electronic crossover and subsonic filter—as well as the three power amps. For easy transport, the TriFlex subwoofer can be turned onto its built-in 3″ casters, with the satellite speakers secured in the sub’s grille cavity. A cover with pockets to store your microphones and cables is also provided. The powerful Peavey TriFlex II also sets up in seconds. Once in position, simply remove the two satellite speakers and turn the subwoofer onto its rubber feet so the preamp controls, inputs and outputs are conveniently positioned at the top rear of the subwoofer enclosure. 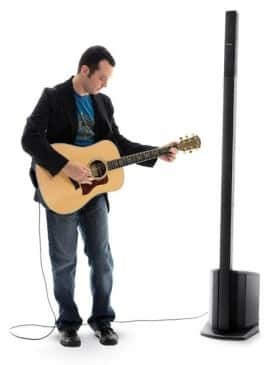 The satellite loudspeakers feature pole mounts for placing on speaker stands to disperse the sound to the audience. 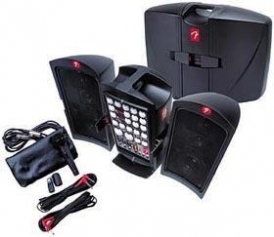 These speakers also have a 45-degree back angle so they can be used as floor monitors when placed on the appropriate side. The TriFlex II enclosures are constructed of sturdy 18 mm MDF with internal bracing and coated with a tough black acrylic paint finish, and feature a 16-gauge perforated metal grille for the ultimate in roadworthy durability.